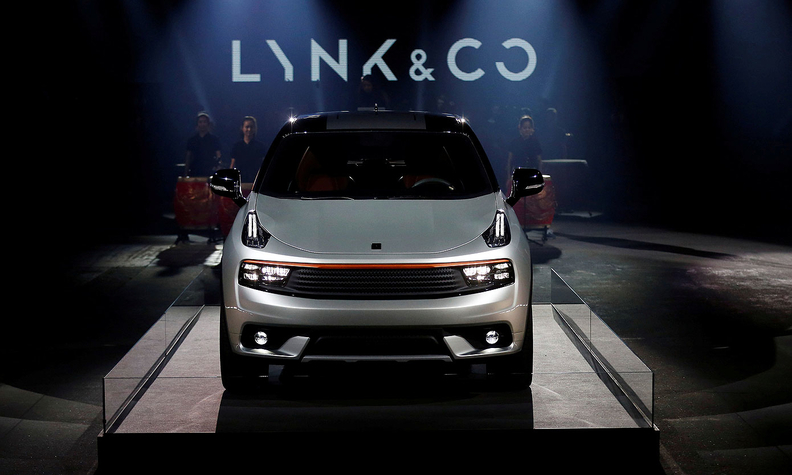 Lynk & CO unveiled its '01' model, a compact crossover, in Berlin last October. NEW ORLEANS -- Chinese automaker Geely Automobile Holdings, the owner of Volvo cars, plans to roll out its mid-priced Lynk & CO brand in the United States and Europe in early 2019, but cautioned those plans could change if President Donald Trump imposes a border tax on imported vehicles. Senior vice president Alain Visser said Geely planned to launch the Lynk & CO brand in San Francisco and Berlin before expanding within months to other cities. The possibility that the U.S. would impose a tax or tariff on imported cars is a consideration, Visser told Reuters on the sidelines of the National Automobile Dealers Association convention in New Orleans. "That's an open question but we're going to offer employment in the U.S. so we believe there's a positive business case to let us in," Visser said. Geely has said Lynk & CO is aimed at the middle of the market where it would likely compete with established brands like Toyota and Honda. Volvo, which Geely bought from Ford in 2010, will continue to focus on premium vehicles, company executives have said. Lynk & CO is also looking to forge partnerships with auto dealers that would allow it to sell its electric and hybrid vehicles through company-owned stores, but get them repaired through a franchised dealer network. "Our target is not to upset the dealers or say their model doesn't work," Visser said. "The dealer model can exist and we're going to offer them business." The brand's first vehicles in Europe and America will likely be plug-in hybrids or possibly even fully electrified. "Because of the cost structure we have, we would be able to offer an electric car at the price of a normal combustion-engine car," he said. U.S. dealers and individual states have aggressively pushed back against Tesla Motors' model of selling directly to consumers instead of using the franchise model. Lynk & CO unveiled its '01' model, a compact SUV, in Berlin last October. The brand expects to open 170 retail stores in China in 2017 and has plans for around 100 stores in American cities. For those who do not want to buy a car, Lynk & CO will allow customers to use cars for a subscription fee, with owners and Lynk & CO sharing the revenue.